The Table of Contents, in large type over a watery background that sports a few sea creatures, lists five sections, including “In the Shallows,” “Coral Gardens,” and “Into the Deep.” Each section contains double-page spreads of dramatic artwork—often of images of blown-up microscopy—that cannot help but draw readers in. Has a 1/8-inch daphnia ever looked so winsome, or have fish gills ever seemed so beautiful? The format of the text is clear and accessible. Each spread’s organism—or group of organisms—shows a common name, Latin name, size, and brief description. There follow a few short paragraphs with more information, some of which emphasize the importance of all members of ecosystems: “Herbivores like the parrotfish help to prevent the reef from becoming choked by algae.” Readers will recognize a few of the highlighted creatures, but it is refreshing to find so many less-than-popular organisms getting some attention. 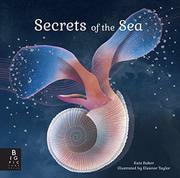 In fact, there are no pages devoted to marine mammals, which arguably also live beneath the waves. Such terms as “bioluminescent,” “polyps,” and “symbiotic” have adequate explanations, but others, including “cephalopod,” “crustacean,” and “prehensile,” may have readers searching in vain for a glossary.